Tintinninae: it's a name which sounds, well, like the tolling of a little bell! All of us have our favorite animal, even in the microscopic world. And why not, because microscopic life is full of surprises. 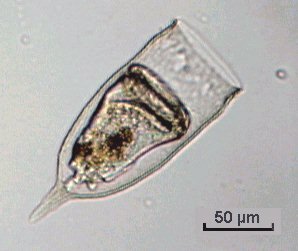 This month I want to show you one of my favorite protozoa. Why is it the most attractive to me? Simply because of its elegant shape. I don't want to put down other protozoan families but they often seem to be just a drop of jelly ornamented with some cilia! 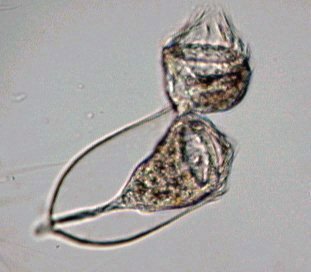 TINTINNINAE are protozoans living in small shells with a conical shape. They are mainly marine organisms as few freshwater species exist. They are classified as SPIROTRICHEA / CHOREATRICHIDA / TINTINNINA. Some of them look like a French Champagne wine glass (but without a foot!). In French these glasses are called 'flûtes' like the musical instrument of the same name. The shell or lorica, which is often transparent, is used as a shelter for the protozoan. 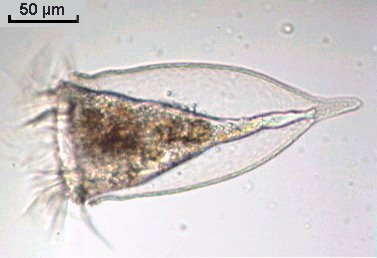 When the critter emerges from its house, it deploys a ciliated crown which has a double function: first it's used to direct food particles towards the mouth (the cystosome, as present in the well known vorticella); secondly it enables it to move quickly, carrying its lorica with it, as the protozoan always remains attached to the base of the lorica. Often I find only empty loricas. They are most interesting but a little difficult to observe when the protozoan inside. It's useful to immobilize them. For example, by removing a little of the water using a paper towel. I avoid using a coverslip because its weight can break the lorica. But I am far from being a taxonomy specialist, and some names are probably wrong. To begin, the pictures above show the most likely encountered familly: Favella; the individuals are shown retracted inside their house or in a feeding posture. All pictures were taken with a 15x objective. This close-up view (below) taken with a 40x objective, shows the well-ciliated crown which is fortuitously rotated towards the objective. The unusual picture (below, and the only one I have observed), shows a favella which is dividing with the new individual (the upper one) still attached to its parent. Both were living specimens with cilia moving rapidly. Below are pictures of Tintinopsis campanulla; its lorica is made of aggregate material which looks like a delicate bell. 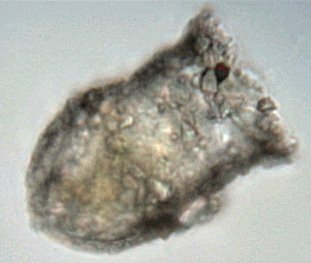 You can see that this protozoan is smaller and has a heavier house than in the Favella family. A protozoan cannot easily displace its lorica. Below is shown another species with an almost cylindrical lorica; Eutintinus. Note the single tail which is attached by at least two points to the lorica. Others, like those in the pictures below, look like shelled amoeba i.e. within a house of dark material. It's probably Codonaria; the first picture clearly shows the protozoan's cilia, so it is not an amoeba! The right-hand picture shows the well agglomerated structure of the lorica. They move rapidly too. Another species (below) with an open bottom lorica (the protozoan is fastened to the lorica wall); species uncertain. Inside the body you can observe many round green algae. 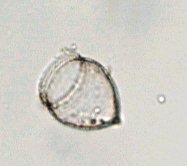 An Helicostomella (below) with a more elongated lorica; note the spiral ornamentation near the aperture, which explains its name. Another species (below) with an elongated lorica but with a granulated structure. It may be Tintinopsis radix. 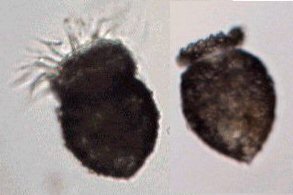 Note the protozoan emerging (left-hand picture) and another retracted (right-hand picture). Two empty loricas from other species (below); the right-hand species is perhaps Metacyclis. The Tintinninae seem very sensitive to salt concentration on the slide. If the sea water evaporates a little, the protozoan literally explodes within its lorica. Empty loricas can be mounted in glycerin gelly for example. Be cautious with those species with loricas of agglomerate material, because they are delicate (as are some testate amoeba shells), and they are crushed easily by the weight of a coverslip. Published in the September 2002 edition of Micscape Magazine.